This name uses Portuguese naming customs. The first or maternal family name is Moreira and the second or paternal family name is Marinho. Born in Diadema, São Paulo, to Ladislao and Regina Marinho, David Luiz arrived at Salvador-based club Vitória after being released by São Paulo, and started playing as a defensive midfielder, almost leaving the club for his poor performances in that position. However, he was soon moved to central defender and adapted well. David Luiz made his official debut for Vitória in 2006, excelling in a 2–2 draw against Santa Cruz for that season's Copa do Brasil. At the worst situation of its history, in the third division, the club eventually promoted to the second level after finishing in second position, with the player appearing in eight of the club's last decisive nine games, scoring his only league goal on 3 September 2006 in a 2–0 home win against Clube Atlético do Porto. On 30 January 2007, David Luiz joined Portuguese club Benfica as a replacement for Tottenham Hotspur-bound Ricardo Rocha, on loan. He made a somewhat tumultuous debut for the club in a UEFA Cup match against Paris Saint-Germain at the Parc des Princes, partnering compatriot Anderson in the centre of defence, replacing the injured Luisão. Benfica lost the match 2–1, but managed to progress to the next round after winning 4–3 on aggregate. On 12 March 2007, he played his first league match for Benfica, against União de Leiria. At the end of the season, David Luiz signed a five-year deal with the club and at the end of the season, following ten league appearances, he joined permanently for €1.5 million. Before the ensuing campaign, he scored his first goal for the club in the Guadiana Trophy friendly tournament, against Sporting Clube de Portugal. David Luiz only managed eight appearances in the league due to injury, however, as Benfica finished fourth. On 11 January 2009, David Luiz netted his first official goal for Benfica, the game's only in a home success against Braga. He played most of the campaign as a left back, at the expense of Portuguese international Jorge Ribeiro. However, it was on the 2009–10 season, when new manager Jorge Jesus arrived to Benfica, that David Luiz became a club symbol and vice-captain. He was ever-present, appearing in 49 official matches (three goals, 4,206 minutes), as Benfica won the league after a five-year wait. In the season's Taça da Liga, in a 1–4 away win against Sporting CP, he opened the score in the eighth minute, with Benfica also eventually winning the competition. David Luiz won the Portuguese Liga Player of the Year that same season, with 38% of the vote while the runner-up, his teammate Ángel Di María, received 8%. On 30 September 2009, Benfica sold 25% of David Luiz's economic rights on any future transfer to a third-party owner, Benfica Stars Fund, along with other teammates. He was tagged at €18 million, with the fund paying €4.5 million; his contract was also renewed in October, with a release clause of €50 million. He made his official Premier League debut on 6 February, replacing José Bosingwa in a 0–1 home loss against Liverpool. Eight days later, he made his first start for Chelsea in a 0–0 draw against Fulham at Craven Cottage. Instantly becoming a cult hero amongst the Chelsea fans, David Luiz was awarded the Barclays Man of the Match award for his performance, despite giving away a penalty in the 93rd minute of the game, which was saved by Petr Čech. On 1 March, David Luiz scored his first goal for Chelsea to help the Blues come from behind to win 2–1 against Manchester United at Stamford Bridge. On 20 March, he headed in his second goal for the Blues for a 2–0 home win over Manchester City, and again receiving the man of the match award, as well as the Premier League Player of the Month for March. David Luiz missed the first three games of 2011–12 season due to a knee injury. He made his return to the first team on 13 September in a Champions League group stage match against Bayer Leverkusen, and he scored from 15 yards to break the deadlock in an eventual 2–0 home win. On his second match, a League Cup third round tie against Fulham, he netted his penalty shoot-out attempt in a 4–3 win (0–0 after 120 minutes). 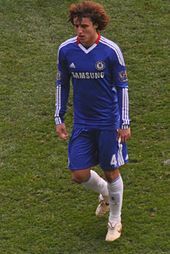 On 5 February 2012, in a league home fixture against Manchester United, David Luiz put Chelsea ahead 3–0 in the 50th minute after his header was deflected by Rio Ferdinand, following a Juan Mata free kick. The match ended with a 3–3 draw. On 25 February, through a curled shot, he opened the score against Bolton Wanderers in an eventual 3–0 at home. On 14 March, Chelsea faced Napoli in the Champions League's round of 16, following a 3–1 loss at the Stadio San Paolo in Naples. David Luiz made a stunning performance to help his team win the tie with a 4–1 extra-time win, being subsequently chosen by UEFA as the man of the match, an accolade he also received in the first leg of the quarter-finals against former team Benfica in a 0–1 away win. However, after leaving the pitch in the FA Cup semi-final against rivals Tottenham with a muscular injury, it was announced that he would miss both of the Champions League semi-finals encounters against Barcelona and the domestic cup final. He played, however, in the Champions League final – John Terry was also suspended for the match – David Luiz appeared, and started for Chelsea, playing the full 120 minutes, along with converting his penalty shootout attempt as the Blues won the shootout 4–3. On 22 September 2012, David Luiz signed a new five-year contract with Chelsea. He started the new season again as a regular alongside either Gary Cahill or Terry, and scored his first goal from a free-kick against Nordsjælland in a 0–4 away win for the campaign's Champions League. In the Club World Cup in 2012, in which Chelsea lost in the final to Corinthians, he was chosen the second best player of the tournament, receiving the Silver Ball for his performances, one of which was as a defensive midfielder. He played in that position in an 8–0 home thrashing of Aston Villa the following week, being chosen man of the Match and netting the second from a free-kick. On 17 April 2013, David Luiz scored during a 3–0 West London derby victory against Fulham. He also scored in both legs of the Europa League semi-finals against Basel; the first was a last minute, low free-kick curled around the wall and into the goalkeeper's bottom left-hand corner to secure a dramatic 2–1 away win, giving Chelsea an advantage going into the second leg at Stamford Bridge. David Luiz was widely criticized for a controversial incident during Chelsea's 0–1 away win over Manchester United at Old Trafford on 5 May. After he elbowed opponent Rafael, the United defender kicked out at him and was sent off. David Luiz, however, was seen smiling while lying on the ground before writhing around in mock agony. David Luiz defended himself, saying he was smiling at the Manchester United fans who could be seen screaming insults and laughing at him. On 13 June 2014, David Luiz transferred to French club Paris Saint-Germain for a £50 million transfer fee, a world-record transfer for a defender, signing a five-year contract. He made his Ligue 1 debut on 16 August, partnering compatriot Marquinhos in central defence as PSG defeated Bastia 2–0 at the Parc des Princes. On 30 September, David Luiz scored his first PSG goal, opening a 3–2 home win over Barcelona in the Champions League group stage. He was seen as a surprise inclusion in the FIFA World Team of the Year at the 2014 Ballon d'Or awards. On 19 January 2015, David Luiz scored his first Ligue 1 goal in a 4–2 defeat of Evian. On 11 March, he scored on his return to Stamford Bridge in the round of 16 of the Champions League as PSG drew 2–2 with his former club Chelsea to knock out the English club on away goals. He apologised for celebrating the goal, saying that it was the result of sudden emotion rather than malice towards his former employers. In David Luiz's first season at the club, PSG won a domestic treble of the Ligue 1 championship, the Coupe de France and the Coupe de la Ligue, in addition to the Trophée des Champions. In his second season at the club, PSG repeated this accomplishment once again, after beating Marseille in the Coupe de France final. On 31 August 2016, David Luiz returned to Chelsea from PSG, for a reported fee of £34 million, and signed a three-year deal. On 16 September 2016, he made his return debut at home in a 2–1 defeat against Liverpool after John Terry was ruled out for ten days. On 31 January 2017, David Luiz scored his first goal for the season from a free kick against Liverpool at Anfield. His goal marked his first Premier League goal since April 2013. On 20 April 2017, Luiz was named in the PFA Team of the Year for the 2016–17 Premier League season. Luiz was selected for Chelsea's first match of the 2017–18 Premier League season, against Burnley on 12 August 2017, and scored late on in their 3–2 defeat. On 17 September 2017, Luiz received a straight red after a poor challenge on Sead Kolašinac during a 0–0 draw against Arsenal. Luiz became the third player to be sent-off in the last three meetings between the two rivals from London; with the others being Pedro during the FA Community Shield and Victor Moses during the FA Cup Final. Luiz scored his first goal of the 2018–19 Premier League, heading in the second goal in Chelsea's 2–0 home win over the previously undefeated Manchester City on 8 December. He hit the winning penalty in a 4–2 shootout win in the EFL Cup semi-final second leg at home to Tottenham Hotspur on 24 January 2019. David Luiz playing for Brazil at the 2013 FIFA Confederations Cup. David Luiz played with the Brazil under-20 team at the FIFA U-20 World Cup in 2007, with the team being ousted in the round of 16. Courtesy of his solid season at Benfica, he was first picked for the senior side in a 2–0 friendly win against the United States on 10 August 2010, the first match after Mano Menezes had Dunga as the coach of the Seleção. Prior to making his debut for Brazil, the Portuguese Football Federation had considered calling him up to their own national team. David Luiz was present in every squad during the management of Menezes and was called up to the squad for the Copa América in 2011, but did not make a single appearance at the tournament due to injury. In a friendly with Mexico in October of that year, he scored an own goal, but the Seleção eventually won it 2–1. On 7 September 2012, David Luiz captained Brazil for the first time, appearing in a 1–0 win against South Africa in São Paulo. He was included in the squad for the FIFA Confederations Cup in 2013, which was hosted in his native Brazil. Alongside teammate Thiago Silva, David Luiz started all matches and helped Brazil win their fourth Confederations Cup title. In the final against Spain, he made an outstanding goal-line clearance from Pedro's shot. David Luiz training with Brazil before the 2014 FIFA World Cup opening match, against Croatia. On 2 June, David Luiz was named in Brazil's squad for the 2014 FIFA World Cup. He scored his first international goal in a 1–1 draw against Chile in the round of 16. He subsequently converted the team's first kick in the penalty shootout as they prevailed 3–2. He scored the winning goal from a 35-yard free kick in a 2–1 win against Colombia in the quarter-final, and celebrated the goal by running towards the corner flag and kicking it. In the absence of Thiago Silva due to suspension, David Luiz captained the Seleção in their 7–1 defeat to Germany at the semi-final stage of the tournament. Brazil went on to lose the third-place play-off 3–0 against the Netherlands. David Luiz was a member of Brazil's squad for the 2015 Copa América in Chile. He partnered Miranda in central defence for the team's first two group matches, before being dropped for Thiago Silva, as Brazil were knocked out by Paraguay in the quarter-finals. On 13 November 2015, David Luiz received his first career red card in a 1–1 2018 World Cup qualifying draw with rivals Argentina in Buenos Aires. In 2016, David Luiz and Thiago Silva were among several experienced players who were not chosen for the squad that travelled to the Copa América Centenario in the United States. Although primarily a centre back, David Luiz can also be deployed as a defensive midfielder, and has drawn praise for his physical strength, work-rate, technique, and range of distribution as a defender, as well as his personality, composure in possession, and confidence on the ball, which enables him to play the ball out from the back or launch an attack with long balls after winning back possession. A powerful striker of the ball from distance, Luiz has also been known to take and score from long-range free kicks. Although in the past he has been criticised in the media for his inconsistent defensive performances, and for being reckless in his challenges, as well as prone to errors or lapses in concentration, during the 2016–17 season, he showed notable improvements upon his return to Chelsea, when the club's new manager Antonio Conte decided to deploy him as a ball-playing centre back in a three-man back-line in the team's 3–4–3 formation. Luiz excelled in the new role, while Conte praised the defender for working to improve his composure and concentration, and singled out Luiz as being "crucial" to the team's success, also labelling him as one of the best defenders in the world. Luiz celebrates his goal by pointing to the sky after scoring against Colombia at the World Cup. David Luiz is a devout Christian and has named Kaká as his role model. He said, "My faith gives me the belief that I can go out and perform and improve as a player. It gives me strength and inspiration." He later added, "Everything in life belongs to God. Our purpose has already been mapped out." He received baptism in May 2015 in the indoor swimming pool of his Brazil and PSG teammate Maxwell. 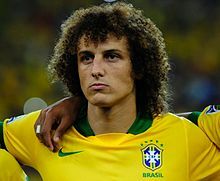 Earlier in his career, David Luiz was likened physically to the Brazilian basketball player Anderson Varejão by fans in his own country, due to their similar hairstyle. In England, he was referred to as The Simpsons villain Sideshow Bob by opposition fans, and also in self-reference. David Luiz is also a Portuguese citizen, which was acquired during his time at Benfica. Portugal wanted him to represent their national team, but he opted to play for his native Brazil instead. 1Continental competitions include the UEFA Champions League, UEFA Cup / Europa League and UEFA Super Cup. 2Other tournaments include the Trophée des Champions, FA Community Shield, FIFA Club World Cup, Supertaça Cândido de Oliveira and Campeonato Baiano. David Luiz battling with Chile's Alexis Sánchez in the 2014 FIFA World Cup round of 16. ^ "David Luiz". Barry Hugman's Footballers. Retrieved 10 February 2018. ^ "David Luiz – Profile". Confederations Cup Brazil 2013. FIFA.com. Archived from the original on 30 October 2013. Retrieved 21 January 2014. ^ a b Fleming, Mark; Herbert, Ian (24 January 2011). "Chelsea set to capture £21m David Luiz". The Independent. Retrieved 5 April 2011. ^ a b "'Crazy mistakes' won't affect David Luiz as he eyes a return to form for Chelsea". Goal.com. 26 November 2011. ^ a b Sheen, Tom (13 June 2014). "David Luiz: PSG defender signed five-year deal after £50m move from Chelsea". The Independent. Archived from the original on 15 July 2014. Retrieved 13 June 2014. ^ a b "Transfer news: Paris Saint-Germain confirm £50million purchase of Chelsea's David Luiz". Sky Sports. 13 June 2014. Archived from the original on 14 July 2014. Retrieved 13 June 2014. 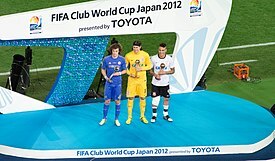 ^ a b "PSG sign Chelsea defender Luiz on a five-year deal". ESPN. 13 June 2014. Archived from the original on 14 July 2014. Retrieved 13 June 2014. ^ "David Luiz returns". Chelsea F.C. 31 August 2016. Retrieved 9 October 2017. ^ "David Luiz é o representante de Diadema na Seleção Brasileira" [David Luiz represents Diadema in Brazil national team] (in Portuguese). Tvabcd. 24 September 2010. Archived from the original on 6 July 2011. Retrieved 19 January 2011. ^ ""Pensei em dispensar David Luiz", revela coordenador da base do Vitória. Veja!" ["I thought about letting David Luiz go", reveals Vitória's youth system coordinator. Look!]. Yahoo! (in Portuguese). Esporte Interativo. 14 December 2012. Retrieved 9 October 2017. ^ a b Eliano Jorge (27 July 2010). "Zagueiro convocado por Mano é avaliado em R$ 114,5 milhões" [Stopper selected by Mano is worth R$ 114,5 millions] (in Portuguese). Gterra. Retrieved 9 October 2017. ^ "Campeonato Brasileiro Série C – 2006" (in Portuguese). Campeoes do Futebol. Retrieved 9 October 2017. ^ "Vitória" (in Portuguese). Futebol 80. Retrieved 9 October 2017. ^ "Tactical Formation". Football-Lineups. Archived from the original on 11 October 2007. Retrieved 14 March 2007. ^ a b c d e Duarte, Fernando (1 February 2011). "David Luiz embraces Chelsea but will never abandon Brazil". The Guardian. Retrieved 9 October 2017. ^ "Comunicado" [Announcement] (PDF) (in Portuguese). CMVM. 30 September 2010. Retrieved 9 October 2017. ^ "Comunicado" [Announcement] (PDF) (in Portuguese). CMVM. 15 October 2009. Retrieved 9 October 2017. ^ "Chelsea complete £21.3m Luiz signing]". ESPN Soccernet. 31 January 2011. Retrieved 9 October 2017. ^ "David Luiz signs". Chelsea F.C. 1 February 2011. Archived from the original on 13 July 2012. Retrieved 24 June 2014. ^ "David Luiz transferido para o Chelsea". S.L. Benfica. 31 January 2011. Archived from the original on 7 April 2011. Retrieved 22 June 2011. ^ "Comunicado" [Announcement] (PDF) (in Portuguese). CMVM. 31 January 2011. Retrieved 9 October 2017. ^ McNulty, Phil (6 February 2011). "Chelsea 0–1 Liverpool". BBC Sport. Retrieved 9 October 2017. ^ Ashenden, Mark (14 February 2011). "Fulham 0–0 Chelsea". BBC Sport. Retrieved 9 October 2017. ^ Phil McNulty (1 March 2011). "Chelsea 2–1 Man Utd". BBC Sport. Retrieved 9 October 2017. ^ Alistair Magowan (20 March 2011). "Chelsea 2–0 Man City". BBC Sport. Retrieved 9 October 2017. ^ "March awards for Chelsea pair". Chelsea FC. 1 April 2011. Archived from the original on 24 June 2014. Retrieved 24 June 2014. ^ a b "Chelsea boost as Petr Cech and David Luiz return for Sunderland". This Is London. 8 September 2011. Archived from the original on 14 January 2013. Retrieved 9 September 2011. ^ "Blues see off battling Leverkusen". Daily Express. 13 September 2011. Retrieved 9 October 2017. ^ "Chelsea 0–0 Fulham". BBC Sport. 21 September 2011. Retrieved 9 October 2017. ^ "Hernandez header completes United comeback". ESPN Soccernet. 5 February 2012. Archived from the original on 7 February 2012. Retrieved 5 February 2012. ^ Rumsby, Ben (25 February 2012). "Chelsea end winless run against Bolton". The Independent. Archived from the original on 15 July 2014. Retrieved 25 February 2012. ^ Trevor Haylett (14 March 2012). "Ivanović completes rousing Chelsea comeback". UEFA. Archived from the original on 8 April 2012. Retrieved 21 March 2012. ^ Andrew Haslam (20 May 2012). "Shoot-out win ends Chelsea's long wait for glory". UEFA. Retrieved 9 October 2017. ^ "New Deal for David Luiz". Chelsea F.C. Official Website. 22 September 2012. Archived from the original on 31 October 2012. Retrieved 6 February 2013. ^ Trevor Haylett (2 October 2012). "Nordsjælland wings clipped by clinical Chelsea". UEFA. Retrieved 24 October 2012. ^ "Rampant Blues crush Villa". MSN. 23 December 2012. Archived from the original on 14 July 2014. Retrieved 24 June 2014. ^ Lythell, Phil (23 December 2012). "Luiz reinvented as Chelsea destroy Villa". ESPN FC. Archived from the original on 14 July 2014. Retrieved 24 June 2014. ^ "Match Report: Basel 1 Chelsea 2". Chelsea F.C. 25 April 2013. Archived from the original on 10 September 2013. Retrieved 24 June 2014. ^ Paul, Ciolan (25 April 2013). "David Luiz Freekick Goal vs. Basel". YouTube. Retrieved 24 June 2014. ^ Luckhurst, Simon (7 May 2013). "David Luíz 'Smiled At Sideshow Bob' Gibe, Not Rafael Da Silva Red Card". HuffPost. Retrieved 9 October 2017. The Chelsea defender was widely criticised for smiling as he lay on the turf after Rafael lashed out at his compatriot, following two elbows from the Brazilian during Chelsea's 1–0 Barclays Premier League win. ^ McDonnell, David (6 May 2013). "Con artist: Fergie slams Chelsea's smiling victim David Luiz for 'getting Rafael sent off'". The Mirror. Retrieved 9 October 2017. Rafael was shown a straight red card for kicking out at Luiz... But the talking point was the dismissal, with Manchester United boss Ferguson incensed by Luiz, who was caught smiling by TV cameras, before writhing around in mock agony to get Rafael sent off in the 89th minute. ^ Blackburn, Martin (5 May 2013). "Swan fake". The Sun. Retrieved 9 October 2017. Rafael kicked out at Luiz — and TV cameras caught the Blues star smiling as he rolled around on the turf. ^ Jeremy Wilson (6 May 2013). "Chelsea's David Luiz: I was smiling at jeering Manchester United fans, not Rafael's red card". The Telegraph. Retrieved 14 July 2013. ^ "UNE GRANDE PREMIÈRE RÉUSSIE!" [A Great First Success!] (in French). Paris Saint-Germain F.C. 16 August 2014. Archived from the original on 3 September 2014. Retrieved 30 September 2014. ^ "Paris St G 3–2 Barcelona". BBC Sport. 30 September 2014. Retrieved 9 October 2017. ^ "David Luiz is shock entry in Fifa World Team of the Year at 2014 Ballon d'Or awards". The Telegraph. Telegraph Media Group. Retrieved 9 October 2017. ^ "Paris Saint-Germain made to work for three points against Evian". ESPN FC. 18 January 2015. Retrieved 9 October 2017. ^ "Chelsea 2–2 Paris St G". BBC Sport. 11 March 2015. Retrieved 9 October 2017. ^ "Champions League: David Luiz apologises to Chelsea fans". BBC Sport. 12 March 2015. Retrieved 9 October 2017. ^ "PSG land unique treble as Cavani grabs French Cup winner". Reuters. 30 May 2015. Retrieved 9 October 2017. ^ "PSG takes domestic treble beating Marseille". 22 May 2016. Retrieved 9 October 2017. ^ "David Luiz: Chelsea re-sign Brazil defender from PSG for £34m". BBC Sport. 31 August 2016. Retrieved 9 October 2017. ^ "Chelsea 1–2 Liverpool". BBC Sport. 15 September 2016. Retrieved 9 October 2017. ^ a b Phil McNulty (31 January 2017). "Liverpool 1–1 Chelsea". BBC Sport. Retrieved 9 October 2017. ^ Dawkes, Phil (12 August 2017). "Chelsea 2–3 Burnley". BBC Sport. Retrieved 22 February 2018. ^ "Chelsea 0–0 Arsenal". BBC Sport. 17 September 2017. Retrieved 9 October 2017. ^ "Liverpool go top as Man City stumble at Chelsea". The Sydney Morning Herald. 9 December 2018. Retrieved 10 December 2018. ^ "Carabao Cup semi-final: Chelsea beat Tottenham 4-2 on penalties to book final clash with Manchester City at Wembley". Sportinglife.com. Retrieved 25 January 2019. ^ "David Luiz será o capitão da Seleção Brasileira contra a África do Sul". Goal.com (in Portuguese). 7 September 2012. Retrieved 9 October 2017. ^ "Chelsea star David Luiz makes miraculous clearance to help Brazil lift Confederations Cup – video". Metro. 1 July 2013. Retrieved 9 October 2017. ^ Keeghann Sinanan (30 June 2013). "Confederations Cup: Brazil Dominate Spain In Final At The Maracana (VIDEO/PHOTOS)". HuffPost. Retrieved 9 October 2017. ^ "Brazil World Cup 2014 squad". The Daily Telegraph. 2 June 2014. Retrieved 9 October 2017. ^ David Ornstein (28 June 2014). "Brazil 1–1 Chile". BBC Sport. Retrieved 9 October 2017. ^ a b Phil McNutty (4 July 2014). "Brazil 2–1 Colombia". BBC Sport. Retrieved 9 October 2017. ^ "Brazil 1–7 Germany". BBC Sport. 8 July 2014. Retrieved 9 October 2017. ^ "Brazil 0–3 Netherlands". FIFA. Retrieved 9 October 2017. ^ "Brazil and Dunga learning to play without Neymar is a sign of progress". ESPN. 21 June 2015. Retrieved 9 October 2017. ^ "Brazil fightback thwarts Argentina". FIFA. 14 November 2015. Archived from the original on 16 November 2015. ^ Schaerlaeckens, Leander (5 May 2016). "Brazil's Copa America Centenario roster looks to be experimental". Yahoo!. Retrieved 9 October 2017. ^ Barney Ronay (13 May 2017). "Antonio Conte's brilliance has turned Chelsea's pop-up team into champions". The Guardian. Retrieved 9 October 2017. ^ Thore Haugstad (5 January 2017). "Pochettino copies Conte, Tottenham thwart Costa to deny Chelsea". ESPN. Retrieved 9 October 2017. ^ "Antonio Conte's tactical shift cures Chelsea from back to front". The Daily Telegraph. 24 October 2016. Retrieved 9 October 2017. ^ Dan Levene (7 November 2016). "Chelsea laying claim to Barcelona legacy with Conte's masterstroke". Eurosport. Retrieved 9 October 2017. ^ Miguel Delaney (15 April 2017). "Antonio Conte saw reinventing David Luiz and overcoming Chelsea criticism as 'great challenge'". The Independent. Retrieved 9 October 2017. ^ Liam Twomey (15 April 2017). "Chelsea never doubted David Luiz's quality as top defender – Antonio Conte". ESPN FC. Retrieved 9 October 2017. ^ Tim Vickery (7 March 2011). "Is Luiz the new Lucio?". BBC Sport. Retrieved 9 October 2017. ^ Jenson, Pete (21 October 2011). "Luiz's Christian faith behind Chelsea's hands-on attitude". The Independent. Retrieved 9 October 2017. ^ Rice, Simon (22 May 2015). "Former Chelsea player says: 'I'm not a virgin'". The Independent. Retrieved 27 March 2019. ^ Wallace, Sam (7 May 2013). "Chelsea defender David Luiz claims smirk followed Manchester United fan's 'Sideshow Bob' jibe". The Independent. Retrieved 9 October 2017. ^ Kay, Alex (4 February 2013). "EXCLUSIVE: Samba stars Luiz and Cesar (or should that be Sideshow Bob and Buzz?) talk to Sportsmail ahead of England v Brazil". Daily Mail. Retrieved 9 October 2017. ^ "David Luiz embraces Chelsea but will never abandon Brazil". The Guardian. Retrieved 9 October 2017. ^ a b "David Luiz Profile". UEFA.com. Retrieved 5 July 2014. ^ a b "David Luiz: Overview". Premier League. Retrieved 28 September 2018. ^ "Auxerre – Paris Season 2014/2015 – PSG.fr". psg.fr. Retrieved 9 September 2015. ^ "David Luiz". www.eurosport.com. Retrieved 9 October 2018. ^ "2012 FIFA Club World Cup awards". Fédération Internationale de Football Association. Retrieved 22 February 2018. ^ "The Dream Team". FIFA. Archived from the original on 17 August 2014. Retrieved 21 September 2014. ^ "Trophées UNFP : Lacazette, Fékir (OL) et Blanc (PSG) sacrés". Retrieved 17 May 2015. 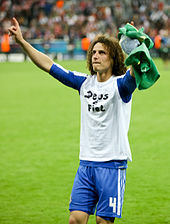 Wikimedia Commons has media related to David Luiz.